A Saturday beach cleaning is in the works for Southern Links Beach, and NPO Okinawa OCEAN is joining forces with Citigroup and the general public to participate in a third cleaning at the beach. The beach cleaning gets under way at 1 p.m., and Citigroup is sponsoring a barbeque, complete with an assortment of sausages, hamburgers, chicken, steak, salads and chips, to entice and motivate people to join in the beach cleaning effort. Vice President Tim Jurgens says Saturday’s beach cleaning is the sixth sponsored by Citigroup, and the seventh he’s participated in. NPO Okinawa O.C.E.A.N. will provide all the materials needed for a thorough beach cleaning, including gloes, trash tongs and rakes. Yaese Town will provide the bags. Naoko Kiyan, NPO Okinawa O.C.E.A.N. Managing Director, is also looking for old, hard plastic suitcases to create a ‘trunk museum’. The NPO will pick up the suitcases. Call 090-1945-2734 to confirm participation in Saturday’s beach cleaning, or to have a suitcase picked up. Those seeking more information can also contract Edo Heinrich-Sanchez at edo@okinawaocean.org or edosensei@hotmail.com. Beach cleaning campaigns led by NPO Okinawa O.C.E.A.N. have received awards from both the Okinawa Prefecture and Okinawa Convention & Visitor’s Burea, as well as the Japan Coast guard and the central government. 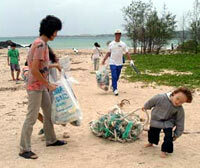 The Okinawa Cleanup UUIMARI-ICC International Coastal Cleanup is coming in September.